As we look forward to being back on the water for Whit week we inevitably think back to how it all started for us, with our early jet boating days with Shaun at Ocean Dynamics / Thousand Islands. The leaflet on the left is from the 80s but the photo may well have been from the 70s 🙂 . Shaun White set up Thousand Islands Expeditions in 1975. 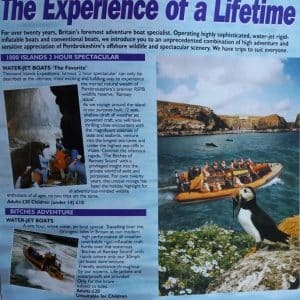 As far as we know he was the first person in the UK (quite possibly in Europe or beyond) to run passenger trips on RIBs and for many years we worked as the only RIBs alongside a team of successful hard boat wildlife tour operators – most of whom didn’t think much about the new fangled RIBs to begin with! Up until this point RIBs were used by the rescue services and military. Shaun used an Atlantic 21 at first, assisted by his passengers to launch daily at Whitesands beach, St Davids. He would drive the boat down on her trailer and passengers would help him to push it into the water. Shaun was passionate about wildlife (particularly birds) and as a former RSPB warden on Ramsey he knew how special the island was. He started his trips to share this island experience but soon found that Ramsey’s rock-infested strong tidal waters were quite a challenge even for the Atlantic 21 to do the sort of trip he wanted to do. His solution was to set about building his own boat, in aluminium since GRP simply didn’t have the strength or longevity he was looking for. Designing and building a boat from flat sheets of aluminium (they didn’t arrive in kit form then!) was an achievement in itself (RIBs were made of GRP) but he decided to import a jet from New Zealand to really get to grips with Ramsey’s beautiful but rather challenging coastline. He knew a good design when he saw it and duly ordered a Hamilton, the grandad of jets – does what it says on the tin and is as tough as they come. 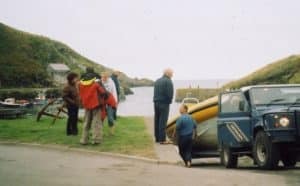 As far as we know Shaun was the first person to put a jet in a RIB in the UK but he was certainly the first to run jet boat adventures. With his Ocean Dynamics Ribworkers he set the standard for a new breed of boat, a RIB that could deal with seas way beyond the capacities of other boats its size and could operate meaningfully as a work boat when needed. The early Ribworkers weren’t fast by modern standards. People today would smile but back in the 1980s (and 90s) you had to demonstrate that you had specialist training from the manufacturer to drive a ‘high speed craft’. High speed was deemed to be 25 knots. They were pretty quick (25 knots is pretty useful) and manoeuvrable, albeit not in the way that Shearwater is, but they really came into their own in awkward seas. We worked them for many years with manual jet controls, lowering the deflector or ‘bucket’ over the jet by winding a handle up and down. We got pretty quick at it but you need more than human power to lower a deflector fast – the jet unit thrusts out several tonnes of water per minute and it’s simply too powerful. We welcomed the ‘new’ hydraulic controls with enthusiasm when they arrived in the 90s and we took our first steps towards what are now the ‘Wet and Wild’ manoeuvres our passengers so enjoy. Shaun attracted people who were passionate about the water and the wildlife to work with him – one young Tim Brooke, for example, a commercial diver with dive boat experience. A few years later Piers Thurston came on board. Piers was an immensely capable sailor with a passion for wildlife and a gift for sharing his considerable knowledge (about seemingly everything!). Shaun focused increasingly on boat building and design at Ocean Dynamics as Piers and Tim (and a very capable team o f second skippers) took the helm of the Thousand Islands boats (mostly jet but some with outboards) until 2003 when the business changed hands. We missed the jet boats. So did our former passengers. So we did the crazy thing and bought our own Ribworker. The rather poor picture to the right shows Shaun reversing Shearwater down the slipway at Porthgain for her first sea trials. Piers looks on and Laurie, our first crew (sensibly clutching good waterpoofs! ), contemplates his first trip on Shearwater. Here we are starting our 15th season, living proof that jet boats are addictive. 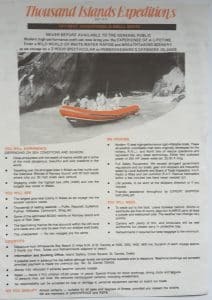 It would be good to be able to pass the jet boating adventure on to the next generation but if no-one comes forward to take it on to be honest we have a good bit of jet boating to do and it would be no hardship to continue sailing Shearwater for a while to ease into our retirement 🙂 .